Begob and bejabbers, are ye Irish? My family hails from both Ireland and Scotland, and while Karma-Kat and Bravo-Dawg can’t claim the same, it’s fun to share St Patrick’s Day pets breeds that have a distinctive Irish heritage. After all, St Patrick’s Day offers the perfect time to brag some blarney and lift a pint of greet beverage! 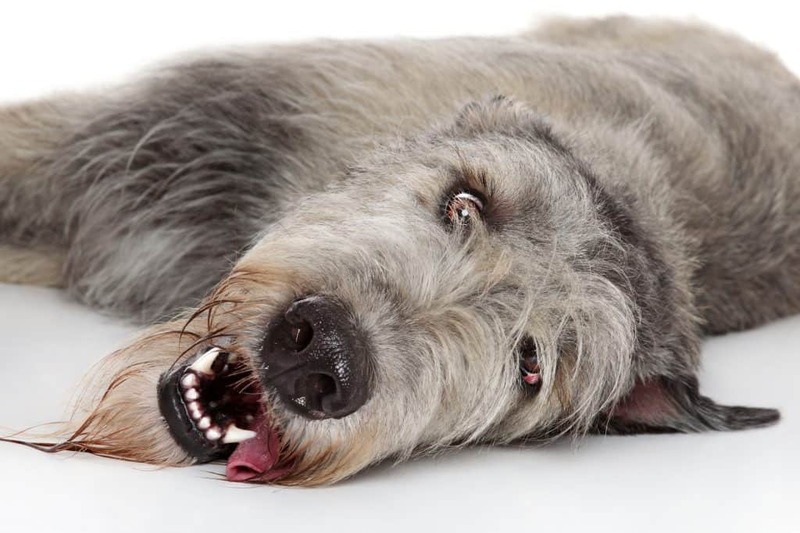 Far more Irish dog breeds fill the list. 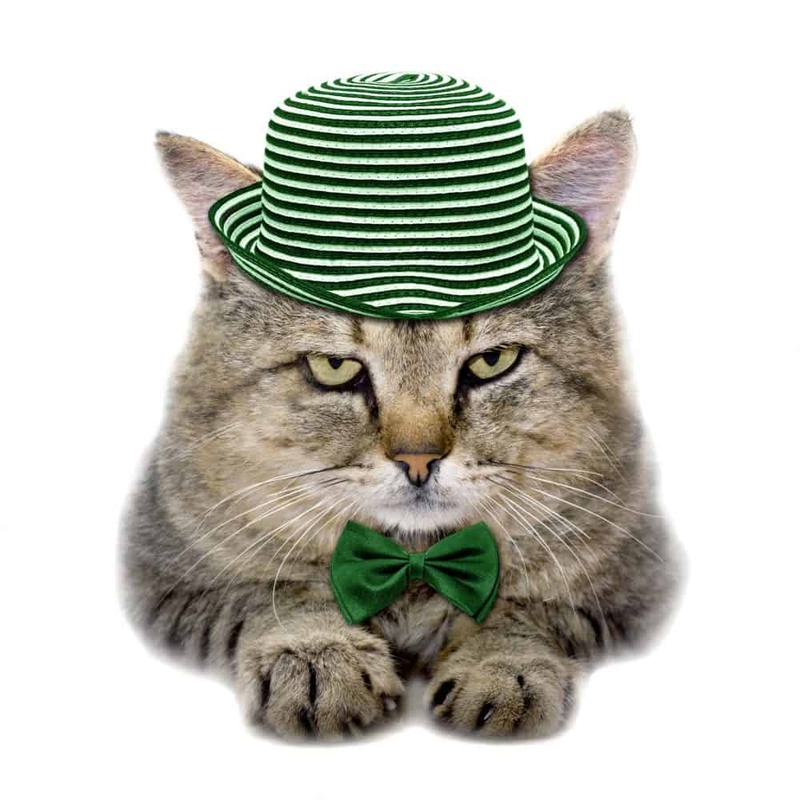 But at least one cat breed arose from Ireland. Legend says the Manx lost her tail when Noah closed the Ark door too soon and cut it off. Not all tailless cats are Manx, the breed that developed in about the 16th century on the Isle of Man. Some Manx have residual tails, known as risers, stumpies or stubbies, and longies, according to the length of the tail. The mutant gene responsible for taillessness typically results in only a small hollow where a tail would be. Their rear legs appear to be longer, giving them a raised rear end. 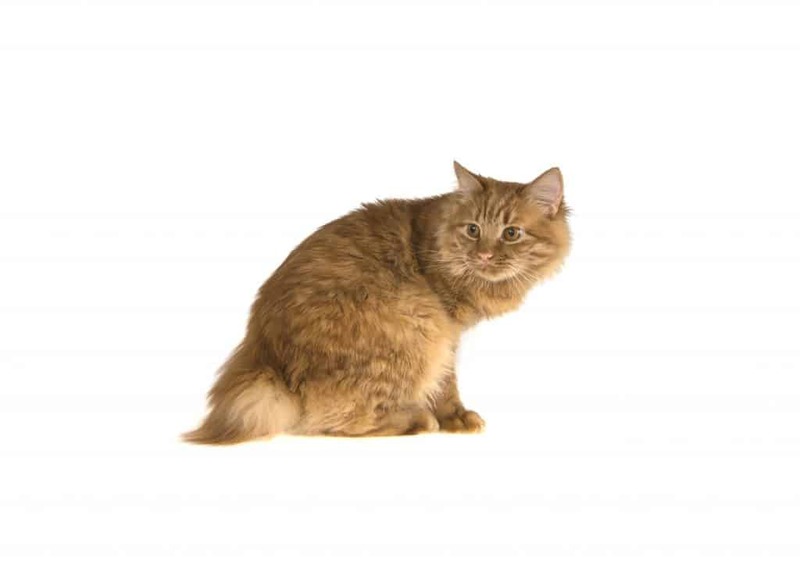 Manx come in nearly all colors, and the longhair variety is identical but called a Cymric. This big red dog became popular in the early 1800s, and today remains a favorite of hunters and families. His handsome moderately long coat is solid mahogany to rich chestnut red and is straight and flat with fringes on the legs, belly, and tail. Described as clown-like for his love of play, he’s a gay, outgoing happy dog that tends to take longer to mature, and remains devoted to his people. Slower to learn than some, the Irish makes a fine family pet. 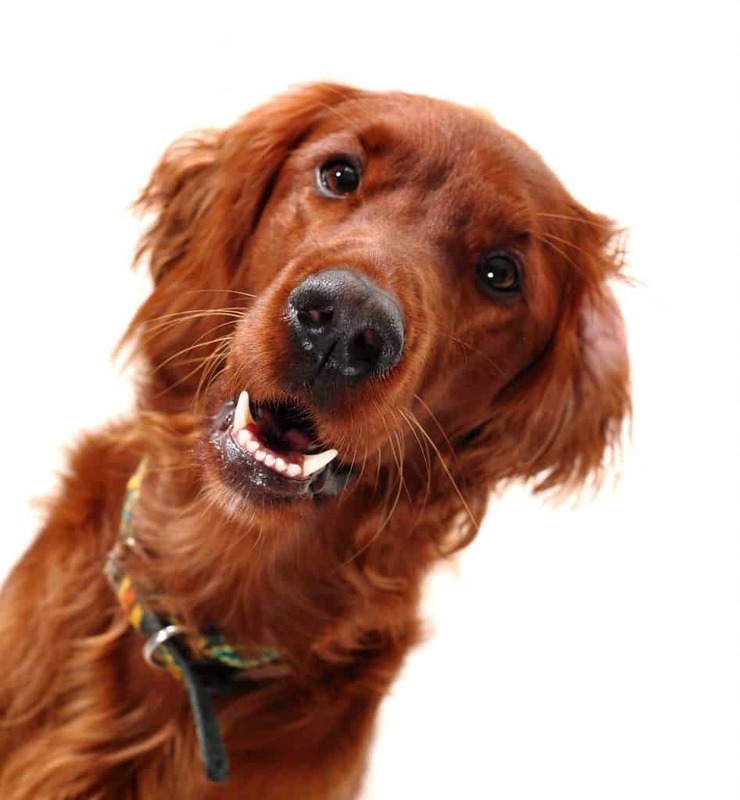 Related to the red Irish Setter, this breed dates back to the 17th Century and is considered the older of the two. He nearly disappeared during the hardships of World War I but was successfully revived in the 1920s. 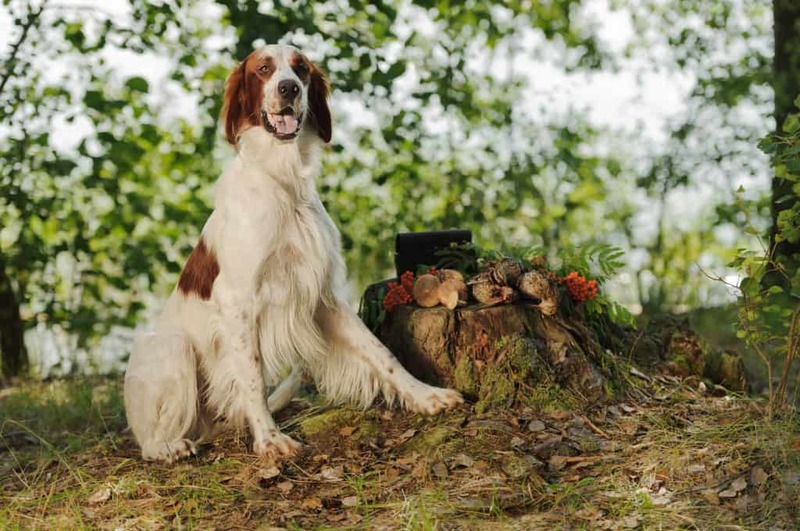 The Irish Kennel Club recognized the Red & White as a separate breed from the red Irish Setter in the 1980s, and the AKC formally recognized the breed in 2009. This medium-size red dog is one of the oldest of the terrier breeds and also claims Ireland as her home. Her shape has been described as a miniature of the old-style Irish Wolfhound, but she is a true terrier in attitude, ready to take on the world. She has been a successful hunter of small game and vermin, loves the water, and some say matches the hunting expertise of the Chesapeake Bay Retriever. During World War I, she even served as a messenger dog. 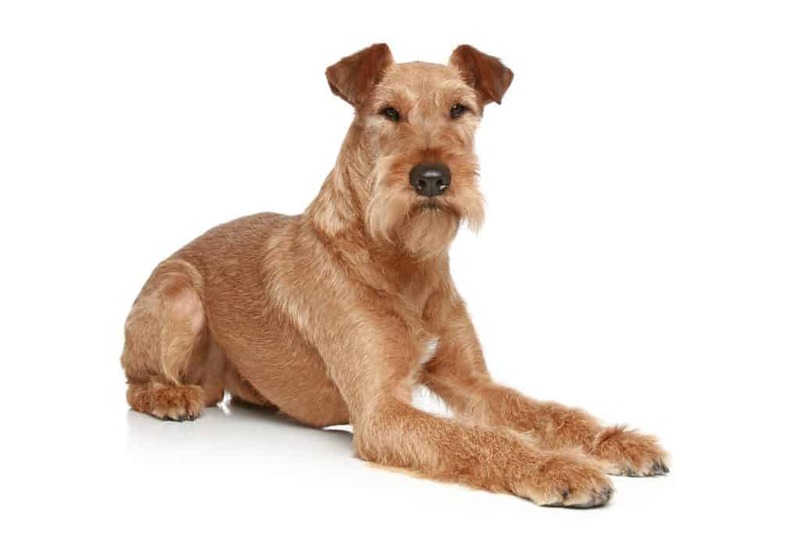 The Irish Terrier is an elegant dog, faithful to family, an eager playmate of older children, and a born guard dog. Like many terriers, she likes to bark and dig and needs a firm hand during training. She is plucky and has a fiery temperament that prompts some to call her the daredevil of terriers. 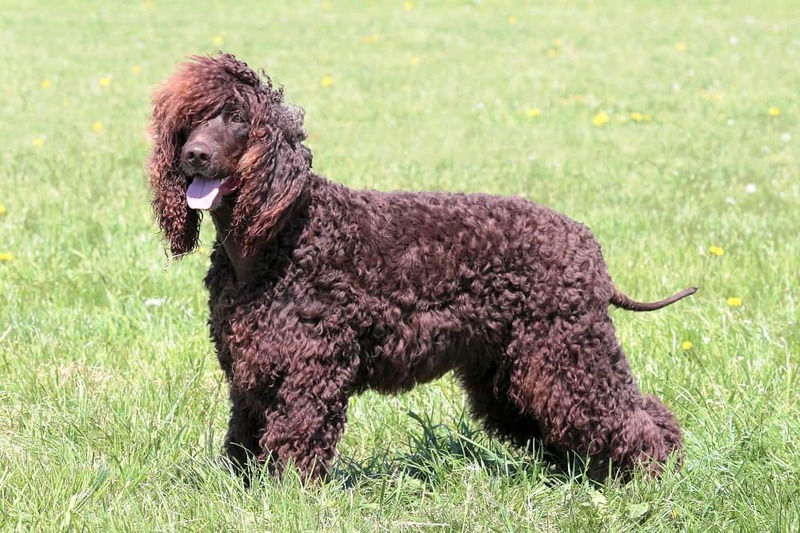 This breed is quite ancient, with similar types traced to the 7th or 8th century A.D. Due to his curly crisp water-resistant liver-colored coat, some might mistake him for a Poodle. The curled fur covers the body but is smooth and short on the front of the throat, face, whip-like tail, and rear legs below the hocks. He’s called the “clown of the spaniels” because of his distinctive topknot and peak of curly fur between the eyes, and his precocious personality. The Irish Water Spaniel is loyal to those he knows, forbidding to strangers, and loves the water. He can be a stubborn dog to train and needs to be kept busy (hunting). He likes children. This is a giant of a dog, sized at 32 inches at the shoulders and 120 pounds. 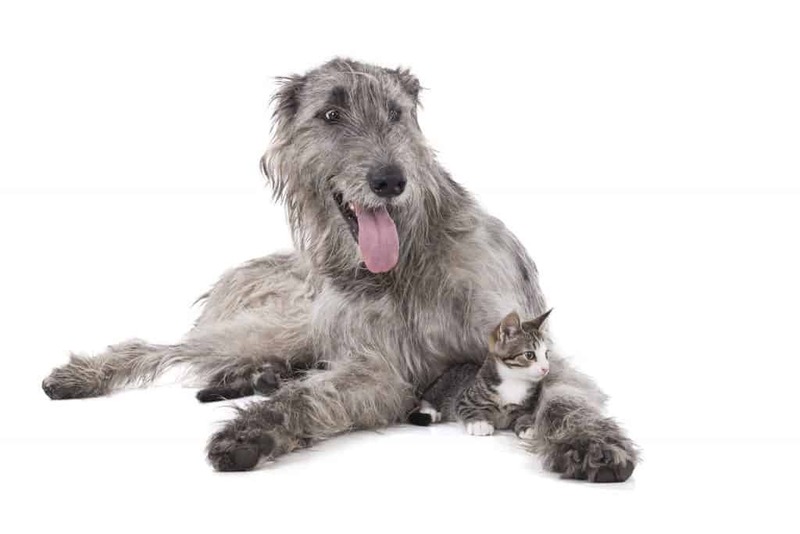 The Wolfhound is a coursing sighthound that’s been known since at least 391 A.D., similar to but more robust than a Greyhound, and with a rough weather-proof coat. Developed to hunt giant Irish elk and wolves, his intimidating appearance makes him seem an appropriate guard dog. In fact, he is a mild-mannered dog that matures slowly and may be timid. Wolfhounds need room to run; be aware, he can leap a 6-foot fence. He may be aggressive toward smaller pets and tends to be suspicious of strangers. His quiet manner and gentle nature make him a good pet for those who understand his needs. This medium size terrier arose in the mountainous region of County Kerry in Ireland several hundred years ago. She is a jack-of-all-trades: a hunter, retriever, and herder of cattle and sheep. She has even been used as a police dog in England. Her distinctive dense and soft wavy coat, always in blue-gray, gives the breed its name. This is a lovable, intelligent dog that does not get along well with other dogs or small pets, and can be a challenge to train. The Wheaten arose at least 200 years ago in Ireland. 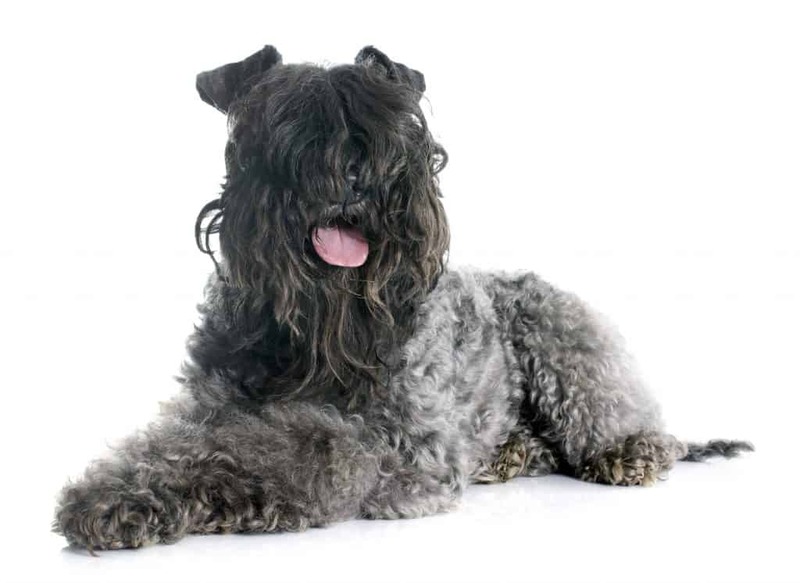 Some people believe him to be an ancestor of the Kerry Blue Terrier. He is a medium-size dog with soft, medium length wheat colored fur. 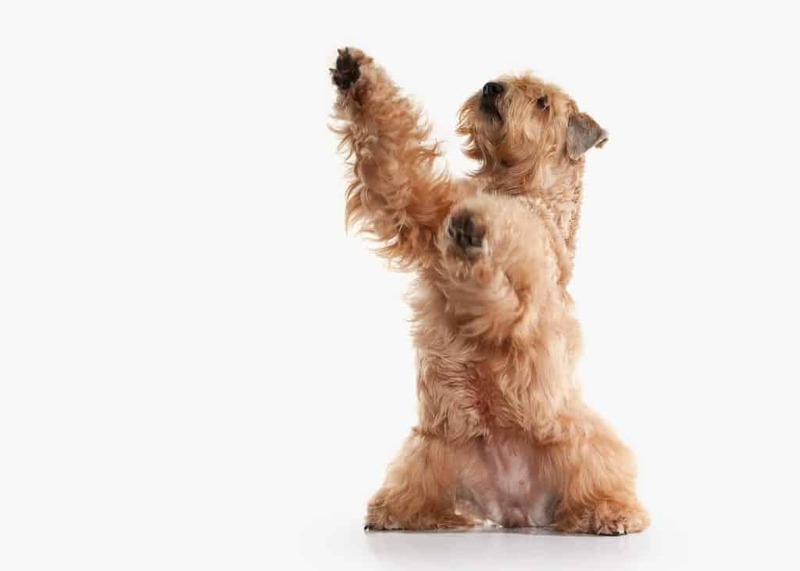 The Wheaten has a mild manner for a terrier. These dogs tend to be worriers and need early socialization to improve his confidence level. Training needs to be slow and patient — not overbearing or demanding — or you risk timidity turning into fear-biting. The Wheaten is a sensitive dog but can be self-confident and gay with those he knows. Do you share your pillow and heart with an IRISH pet? How do you plan to celebrate St Patrick’s Day?